Songbirds can be one of the most rewarding, yet challenging subjects in nature photography. While their colorful plumage is a strong lure for the nature photographer, their small size and non-stop movement makes them one of the most difficult subjects to capture on film. Along with the usual technical considerations, successful songbird photography depends on getting close enough to these small creatures to adequately fill the frame. Doing this in the field is difficult enough, but to then find the perfect, unobstructed perch and a clean, non-distracting background makes the task an extremely difficult one. One way for the avian photographer to tip the odds in his or her favor is to construct an "outdoor bird studio" using bird feeders and attractive perches for them to land on. By strategically placing bird feeders/perches in your yard, you can "set the stage" to capture stunning songbird images. What follows are the details of the bird feeders and perches I have set up in my backyard, along with the equipment and techniques I use to capture the images. With just a few minor adjustments, you can do the same in your yard. The camera equipment used greatly influences the placement of feeders and perches. My camera set up includes a Nikon F4 and a 600mm F5.6 (manual focus) telephoto lens, which has a minimum focusing distance of about 20 feet. With a 600mm lens at this distance, I cannot adequately fill the frame with a small bird, so I add a 27.5mm extension tube, which decreases the minimum focusing distance to 15 feet. At this distance I can get frame-filling images of birds the size of the Blue Jay, Northern Cardinal, and Red-Bellied Woodpecker. 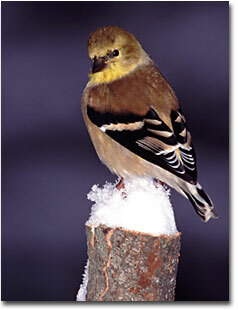 For smaller birds, such as the Goldfinch, Black-Capped Chickadee, and Tufted Titmouse, I add a 1.4X teleconverter. At this point the lens becomes an 840mm/f8 that will focus at 15 feet. Therefore, this is the closest that I can place any of my perches from where I set up my camera equipment. I use a dedicated Nikon SB25 flash that features a zoom head, front and rear curtain sync, exposure compensation and TTL operation. My primary means of metering is in manual mode, spot metering the bark of one of the perches, which is close in tone to an 18% gray card. I set the flash zoom head to 85mm (maximum zoom) and flash operation to rear curtain sync. I set exposure compensation to minus 1.3 EV in TTL mode, which provides a pleasing level of fill illumination and catch lights in the eyes, but does not over power the natural lighting. A Bogen 3051 tripod and a 3038 super ball head are used for support. I use two different feeder systems. My main system is a 4 X 4 post with three tube feeders and suet baskets hanging from the cross arms. This is placed in the ground 15 feet from the open window that I photograph through. That's right, my house is my blind, a very comfortable arrangement for year round bird photography. 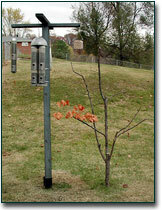 Alongside this feeder I have a small "dead" pear tree placed in the ground. I have trimmed most of the limbs from it, leaving only a minimum number of perches for the birds to sit on. This greatly reduces the amount of camera movement required to compose, focus, and snap the shutter. It also removes distracting limbs from the foreground and background. Drilled in the side of the 4 X 4 post are holes to insert limbs that I have removed from other trees in the yard. This makes it very easy to change the perches so that all of the photographs don't look the same. The background for this set up is the lawn at a lower shooting angle, large distant trees in a neighbor's yard at mid angle, and the sky at the most upward angle. The second system I use is a shepherd's hook, a small hanging feeder, and small tree limbs attached to the shepherd's hook with duct tape. I can pull this up very easily and move it to different locations to change the angle of lighting, background and to accommodate the focusing distance of the lens I am using. I attach the limbs from any species of tree that I want to use as the setting for the photo. These two systems work well together. Although the main system cost about $150.00 to construct, it attracts and feeds many birds, has survived two moves and been in use for over ten years. The shepherd's hook system cost of about $15.00 and is very versatile for quick "stage set" changes I might want to make. I haven't mentioned much yet about the placement of the feeders or the perches to obtain the best lighting because in my case, it's dictated by the position of the house and the "one" available window that I have to photograph through. I am fortunate to be shooting in a northwest direction, so I get very good morning light. I try to plan most of my shooting in the early morning (7AM to 9AM) and on overcast days when shadows are at a minimum. I primarily use 100 ASA film, placing shutter speed in the range of 1/30 (very early morning light) through 1/125 (later morning) to a maximum of 1/250 on bright overcast days at f/8. DOF at 840mm and 15 to 18 feet is very shallow. I am careful to try and catch the bird's body in the same plane as the film in order to get maximum DOF. My camera, lens, and flash weigh approximately ten pounds. This is balanced on the 3038 ball head with the tension adjustment set tight enough to hold it in place without my assistance, but free enough to move at will. I grasp the focusing ring and camera body, move to locate the bird in the viewfinder, compose, focus, and manually snap the shutter. I do not use a cable release and I do not lock the ball head in place before I snap the shutter. This is a technique that I have used for the last ten years and for me is the best balance between stability and ease of camera movement. This bird feeder/perch system can be set up in anyone's backyard and made as simple or as elaborate as you wish. 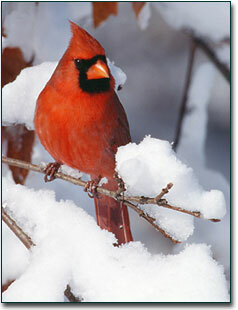 Songbird photos can be taken at any time of the year under any daytime conditions. Through careful placement of the feeders and perches, a variety of pleasing songbird photos can be captured during a single photography session from the comfort of your home. Your imagination and creativity are the only restraints. A bonus to the great photos is the fun and enjoyment for the entire family of watching the wonderful variety of birds that will be attracted to your feeders. Backyard avian photography; it's simple, it's fun, and best of all, extremely rewarding for the avid nature photographer! Editor's Note - Be sure to visit Keith's excellent personal web site. All content copyright 2001, Nature Photographers Online Magazine, Inc. All rights reserved.